Fintech Communications' professional IT consultants take care of your Voice & Data Cabling needs. We provide complete solutions to keep your small business running smoothly. Nothing could be more ordinary, or more essential. Whether Category 5 or Fiber Optic, no network can exist without cable. In some ways, it is as important as electrical wiring, yet more complex and sophisticated. Fintech has been installing data cabling, voice cabling and video cabling for over 10 years. We have seen every scenario and have installed cabling in just about every type of environment. We pride ourselves on providing our customers with a seamless installation that is performed on time and to the best advantage for your needs. From the Networking closet to the desktop, we provide customers with professional installation of every cable. And here are some of the extra steps that we take to make sure that our customers are receiving the best in products and service. Our estimating and tracking system allows us to accurately assess cable needs for every job. You never pay for wasted cable. All cable is properly labeled at the closet end and at the drop location. Drive rings, plastic and Velcro cable wraps are used to assure secure, effective hanging. When needed, cables will be enclosed in a raceway, rather than leaving cables exposed in the office or work environment floor. After installation and termination, every cable is tested for conformance to today's standards. Ethernet cables are essentially the lifeline of our home networks, and our internet. Almost every home network uses ethernet cables to connect either their modem to their router or their routers to their computers.These are especially important for those users who are still on wired networks, and haven't made the jump to wireless yet. For those of you that have had to go out and purchase ethernet cables in the past know that these cables do not come cheap for anything over 10 feet or so. If you have to stretch it up to 20+ feet the price increase is exponential, when in fact, it doesn't really cost that much more to make a longer cable. Ethernet is relatively ubiquitous, in that most computers and peripherals speak ethernet. Ethernet is routable - far too many protocols aren't - and is relatively fast (10 gigabits per second for a high-end card, but you can bundle up to 10 of them to create a pseudo-100 gigabit connection) and is relatively cheap. The Ethernet standard is well established. It is used in a variety of different environments and accordingly there is a variety of different types of cable over which it operates. It is possible not only for Ethernet to operate at different speeds, but there are different varieties of cable that can be used within the same speed category. In order to ensure that Ethernet operates correctly, the types of cable, their electrical conditions and the maximum lengths over which they may operate are specified. For many applications, ready made Ethernet cables may be purchased, and a knowledge of the construction of any Ethernet cables is not required. However for other applications it is necessary to know the construction of the Ethernet cable. As a result of this advertisements for different types of cable, Cat-5, Cat-5e, Cat-6 may be widely seen. These cables may be used for different applications. Fintech Communications offers a wide variety of ethernet cables for the different needs of your network. We have a complete service from installation to troubleshooting to meet the demands of our clients. Contact us now and let us know your needs. We are willing to serve you. 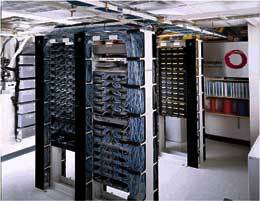 Voice Cabling - Data Cabling Experts in Costa Mesa, CA. Call Fintech IT consultants for best service and support in the Orange County area.